The hovercraft has unique handling characteristics. This manual does not serve as a replacement for driver’s training. Basic training is provided when delivery of a new craft is taken at the Amphibious Marine factory. Advanced training is available for an additional cost, particularly in the case of those wanting to learn how to instruct others. The operator should not be intimidated by the warnings in this document but rather heed them and understand that we are trying to communicate all the possible hazards. This manual is intended as a guide to be used in conjunction with ground training followed by on-the-water training. It does not serve as a replacement for supervised ground training and on-the-water training. The operator should be familiar with and understand all warning labels on the craft. 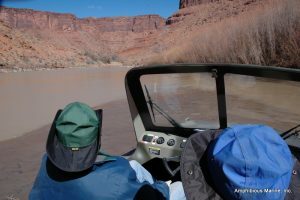 It is the responsibility of the operator to make the passengers aware of any potential hazards that they may be exposed to while riding in the craft. For example, passengers in the rear of the cockpit need to be aware of the dangers of the rotating fan. Long hair, straps, or loose objects should they come in contact with the lift fan can cause serious injury or death. Danger: To avoid serious injury or death: Keep loose objects, straps, and hair away from hovercraft fan. Danger: To avoid serious injury or death: Disconnect battery before entering guard. Warning: To avoid serious injury or death: Re-fuel gas tank outside of cockpit. Caution: To avoid personal injury: Know location and function of all controls; Before starting engine, make certain fan & propeller are clear; The craft can be upset by reducing throttle while the craft is sliding sideways; and Read Operator’s Manual. The Vanguard’s hovercraft top speed of 40 mph (64 kph) on water may seem rather modest when compared to the speeds of automobiles and some powerboats. However, the Vanguard is not limited to 40 mph (64kph) in all conditions. The operator must be aware of conditions that will lead to unreasonably high speeds for the vehicle and the operator’s level of experience. For example, smooth water, ice, tail winds, and downhill could lead to dangerously high speeds. During the operator’s initial experiences, speed should be kept below 20 mph (32 kph). This will require a significant throttle reduction once plane out is achieved. Before starting the engine, visually inspect for items that could pass through the rotor. A loose item can cause damage to the equipment and be sent flying at high speed with the potential to injure or kill those in its path, such as the operator, passengers or bystanders. A pre-flight inspection is required before each operation. A pre-flight inspection should include a visual inspection of the skirt running surface for tears, excessive wear, or any damage that could catch onto objects and cause significant additional damage. A thorough pre-flight will be primarily focused on the rotating equipment. Loose fasteners should be checked for by looking for the tell tale signs of movement caused by loose hardware. This commonly exhibits itself as black or gray dust emanating from moving components and may have a streak appearance especially near areas that get wet and are near the high speed air flow. The engine mounting bolts, engine frame to hull mounting fastners, guard, rudder support bars and engine related hardware should all be periodically checked for loose fasteners. The fan and propeller can be checked by pushing and pulling on the blades to see if there is movement relative to the shaft or each other indicating that they have become loose. Particular attention must be paid to loose items after maintenance has been performed, such as tools, and fasteners. All guarding must be in place. The fan and the propeller should be checked for appropriate clearances and tracking. The fan blade tips should be at least 1/16” from the fan shroud. No object should be within 1” of the fan’s plane of rotation. The propeller tips should have a radial clearance of at least ¾”, 1/8” in the case of the propeller duct. No object should be within 4.5”, fore and aft of the hovercrafts propeller’s plane of rotation. Tracking is the ability of one fan or propeller blade to follow another. Blades should track within ¼” of an inch. During initial testing of a new craft the kill or ignition switch should be tested immediately after the engine is started for the first time. The air drive should also be observed for excessive vibration or movement. Once the air drive has been checked for items that could pass through the rotors as explained above, the engine may be started. Make sure that the battery has been turned on. The battery master switch is located at the rear of the cockpit. Ensure that the throttle has been set to idle speed. Turn the ignition switch on, located on the extreme left of the dashboard. Both the red and blue (EFI engine) indicator lights should be on and the fuel injection pump should be heard to run for two seconds. The red light indicates low oil pressure and the blue light indicates that there is a fuel injection malfunction. Both lights should extinguish when the engine is running. Turn towards the air drive and speak the word “clear”. It is clear when no objects or people are in or near the plane of rotation of the fan or propeller. In addition, no one must be standing within the plane of rotation of the propeller. Wait for a few seconds. If it is clear then depress the starter switch. The engine should start immediately at which point you release the starter switch. Even at this low throttle setting, the skirt will inflate immediately. It is normal on water or ice for the craft to creep forward at idle. Particularly during warm-up as the fuel injection system idles a few hundred rpm faster than normal. An operator’s first experience with the hovercraft should be conducted on water in flat, calm conditions. Initial training on land is strongly discouraged, as this is a more advanced skill. If the hovercraft is started from the shore, care must be taken that the downhill run does not cause excessive speed. The craft should be operated below planing speeds, 4 to 7 mph, while the feel and use of the throttle, rudders, and skirt control (brake) is explored. Once the operator is confident with these controls and their effects, a planeout may be attempted. Rapid acceleration should not be expected, but in 10 to 15 seconds the operator will find the craft exceeding the recommended 20 mph maximum training speed, if the throttle is not reduced to 2200-2500 rpm, conditions depending. The operator should experiment with reducing throttle to slow the craft below planing speed to gain an appreciation on how long this can take without the aid of the brake. The craft’s reaction to fore and aft weight shifting should be experimented with as well. For example, turning will be aided by shifting weight slightly and into the direction of the turn. The operator should experiment with different throttle settings. At around 1600-1800 rpm, the craft will lift up on its cushion of air and at 2200 rpm will be moving forward slowly. Once the vehicle is planed out, good speed can be achieved at 2400 rpm. Full throttle should be 3100-3200 rpm. Vanguard is very lightweight and the payload will frequently outweigh the craft. Therefore, the operator must adjust the seat positions so that the craft is slightly nose up and level side to side. In calm water, the forward passenger and driver may be sitting side by side near the helm, depending on their weight. 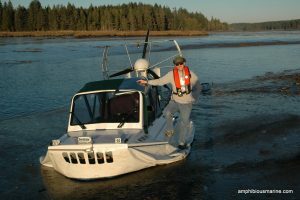 As seas increase to 6 inches to 1 foot, the passenger(s) will have to move back towards the aft cockpit. The operator should become familiar with the skirt control, also known as the brake, as this is an important safety feature. It allows the craft to come to a rapid, but controlled stop once the operator has become proficient with its use. In straight flight at less than 15 mph, the operator should slowly pull the skirt valves open, with the foot brake. It is important to recognize that the brakes create drag at the front of the craft. If the brakes are applied while the craft is in a side-slip a rapid and unexpected turn will result. In an extreme case the craft could be over turned with improper use of the brake in a turn. This is because drag will be imposed on the front, but the stern of the craft will continue forward causing a spin and turn. Care must be taken when applying the brake fully in shallow water or on land as the underside of the craft can strike hidden objects or the ground. The operator should also be aware that application of the brakes and reduction of throttle on ice can be ineffective, particularly in a tail wind. Ice operations may require a 180° turn and application of reverse thrust. Ice operations should be considered an advanced driving skill. Plow-in is the tendency for the bow skirt to tuck under, causing the machine’s bow to drop into the water resulting in a stop that is sufficiently abrupt to cause ejection and possible injury to the occupants of the vehicle. This is a common problem with most hovercraft. However, unlike many hovercraft, the Vanguard has a built in plow plane. The Vanguard is sometimes deliberately plowed in for control purposes, and the stop is gentle. Two types of plow-in occur, spontaneous and forced. In spontaneous plow, a machine is trimmed level for maximum speed. A small disturbance causes the bow skirt to come in contact with the water. The bow skirt will then try to attach itself to the moving water, pulling the craft’s bow down, causing the hull to contact the water. Forced plow-in occurs when a craft is driven from smooth water into rough water at a speed above which it could ordinarily be driven in the rough water. As a result, the cushion simply has insufficient power for the roughness, and skirt drag causes the bow to drop. A hazardous forced plow can occur with the Vanguard if the craft is driven at high speeds on ice and then transitioned onto water. In this case the crafts speed is unusually high because of the lack of drag on ice, but then when the ice ends in water the bow skirt tucks under. A forced plow is also what the skirt control, or brake, does. A plow that would other be gentle could become a hazard in standing waves, such a river or on land or rough terrain that could cause an abrupt stop. After some feel for the controls is gained with the craft on plane, the craft should be brought ashore, taking care to stay well away form obstacles. If the craft is brought to shore at low planing speed, it may fall off plane. The planeout wave can increase in height as the machine approaches land, causing the craft to bog down. The natural impulse is to apply more power to keep craft speed up. Be warned that power must be pulled back as the craft comes ashore. The drag from the planeout wave will abruptly disappear as the craft transitions to dry land, and the craft may shoot forward at a much greater speed than expected. If the craft is allowed to rest on water for any length of time, the bag portion of the skirt will fill with some amount of water. This is dependent upon the load in the hovercraft, any wave action, and the length of time. It must be purged by operating the vehicle at moderate power(2000 rpm), before a planeout is attempted. The purge should take approximately 15-25 seconds. 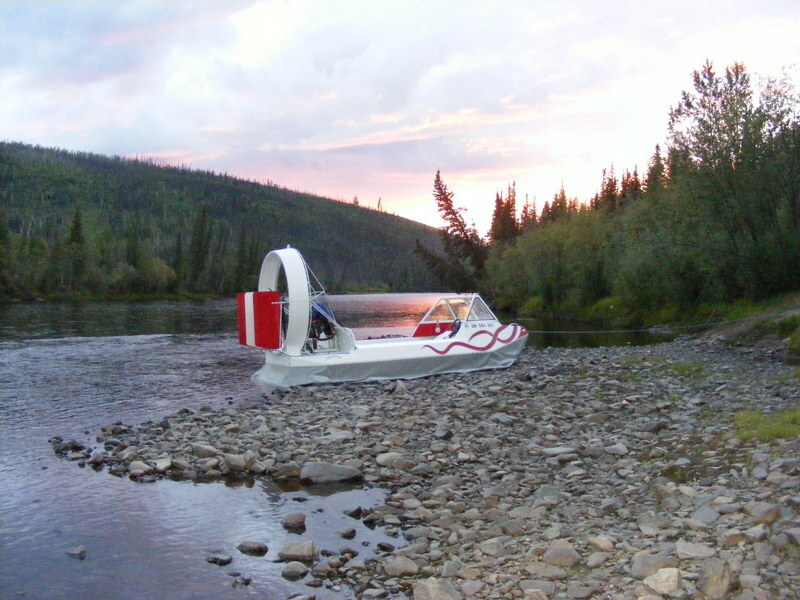 The hovercraft should not be back-slid above 4mph as the bow and partition skirt can hook on the water and be damaged. It follows that the craft should not be back-slid on land if there are hard objects that could catch the bow and partition skirts. When landing the craft on a hard surface, it should be allowed to come to a stop before being set down, as the hull can be damaged. Power should always be maintained or increased when the Vanguard is on plane in a side slip. The machine should not be dropped off cushion when it is side-slipping, as a harsh landing, and at excessive speed an upset is possible. When an emergency stop is required, it is best to straighten the Vanguard to its path of flight and then stop by pulling the brake or shutting off the power. Passengers, other than the operator and trainer, should not be taken along until the operator is proficient with the craft. Turns out of the wind are made by pulling the brake, and aggressively leaning or using the individual forward cushion vents and full rudder. On occasion a 270 degree left turn might have to be substituted for a 90 degree right turn. Another way to turn is to build some speed so the machine is effectively generating its own wind, and then turning. Great caution should be taken in operating in a strong tail wind as extreme speeds may be obtained, and weight may have to be shifted well aft to maintain control. In a tailwind directional stability is reduced, so the operator should be ready for a possible broach, or the vehicle swapping ends. Normally this will not be a problem if the operator catches the broach early and applies correct rudder and or more throttle. Going into a headwind can significantly reduce speed and fuel economy, especially if water roughness is present. Reserve fuel should be planned for. Tacking across the wind may actually be more effective than going straight into the wind. In any case the craft will get to the destination with a little patience. The operator should be wary of new operating environments as they may produce unacceptable skirt wear or cause blown dust, which is annoying to all. Natural surfaces are best. Avoid operating where wheeled vehicles have been, as they produce fine pulverized material which is easily blown into the air. Avoid operating on large asphalt or rough concrete expanses as these surfaces can cause excess wear on the skirt. The new operator should practice avoiding objects in the path of travel that may easily be passed over as this extends skirt life, and gives the operator the experience and skill necessary to avoid hazardous obstructions. Vanguard features an air cushion that is divided into three compartments by a unique skirt design. While the two forward compartments are operated in unison for braking, they can also be operated independently for turning. This feature is a major advantage in that steering is multiplied by the effect of the drag created by venting air from the forward compartments. A power-speed strategy should be used while operating the Vanguard hovercraft. This strategy calls for a reduction in speed before the need to maneuver, and then an increase in power during the turn. For best maneuverability the engine speed needs to be up, allowing necessary airflow over the rudders and reduced skirt drag with the additional lubricating air. Adding power when additional maneuverability is required will also increase speed. Therefore the strategy calls for a speed reduction prior to maneuvering. If power is reduced while the craft is at speed, the craft will carry on for a considerable distance at a speed above that which can be sustained by the new lowered power setting. The machine should not, and indeed sometimes cannot, be maneuvered in this condition. It is inadvisable to side-slip the craft immediately after a power reduction as the side skirt may tuck under, or a “side plow” may occur. Slow down first, and then reapply power so it is at or above that required for maintaining the current speed, and then maneuver. For the safety of others it is inadvisable to run the vehicle at full power near bystanders as the rotors and cushion may throw off blown material or hardware from the craft. Speeds should be kept very low near bystanders as they rarely recognize that the hovercraft does not necessarily head in the direction it is pointed, and they may run into the path of travel. The craft should never be left unattended with the engine running, as the rotors are hazardous to inquisitive persons. No one should be allowed to push the rear of the craft or metal guarding to dislodge or move the craft. The bow handles are the accepted way to dislodge or move the craft. In conclusion, the vehicle should never be operated without the direct supervision of someone who has taken the time to follow these instructions and to learn how to operate the Vanguard. It should be appreciated that safe operation is mostly common sense, and the vehicle should never be operated in a reckless manner. It takes time to develop good judgment with any new vehicle. It should be appreciated that this document cannot teach good judgment. Therefore, the new operator should proceed with caution in learning this new skill. Amphibious Marine cannot be held liable for operators that haven’t been trained by Amphibious Marine or do not choose to heed the warnings in this document. 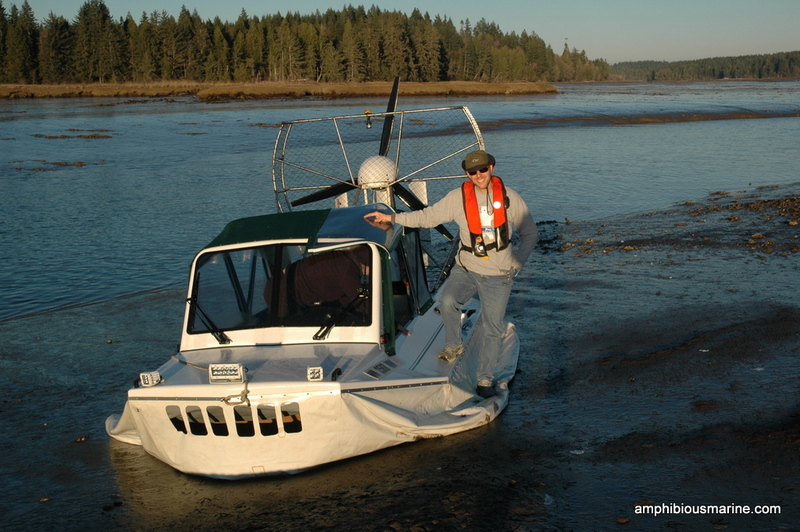 Every attempt has been made to convey hazards that the operator may encounter while using this hovercraft. However, it should be recognized that exceptional or unusual operating environments or conditions that might present unforeseen hazards not mentioned in this document. In normal use over water wear to the skirt is very minimal. After many hundreds of hours of use the fibers in the coated fabric will slowly lose their strength as they fatigue. After many years of use the coated fabric will eventually need to be replaced due to sun exposure, direct abrasion and fatigue. The life for the skirt can be extended by protecting it from the sun when not in use, applying wear patches to specific areas at the ground contact zone and repairing any tears before they turn into larger rips. An emergency skirt field repair kit should be carried along with basic hand tools and boating safety items. The skirt repair kit consists of Kevlar thread, an awl, and a heavy needle. It is not necessary to carry glue in the repair kit as stitching the fabric back together in the event of a large tear is easier to implement in the field. In fact it takes a very large rip to reduce the performance of the craft. By simply bringing the fabric back together normal operations can be restored and permanent repairs carried out at home. It should be noted that rips in the skirt are quite rare and generally only caused by snagging unusually sharp objects or man-made obstructions. Most skirt maintenance is carried out on a seasonal basis. For permanent repairs, rips or adding wear patches, a single part contact cement is used. 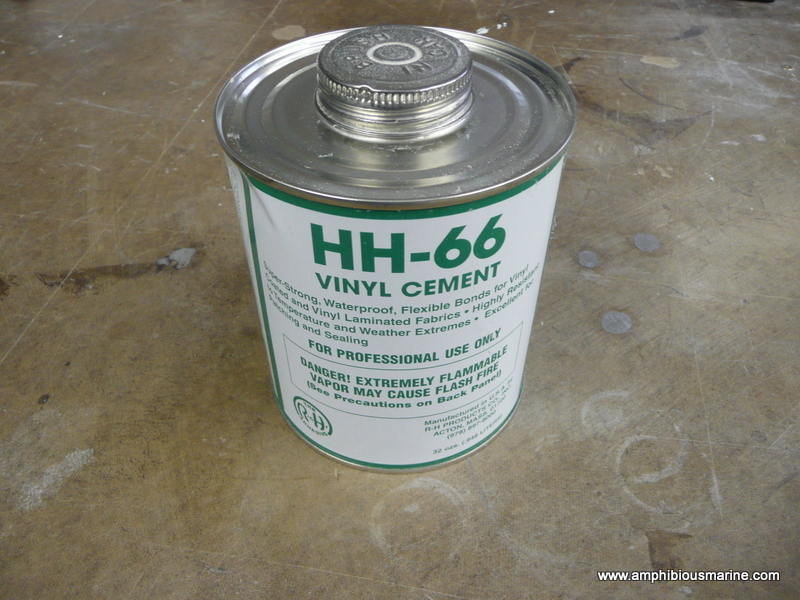 The preferred cement is called HH-66. Many other vinyl cements will work on both the vinyl skirt material or urethane upgrade. A simple test can be performed to determine if the chosen cement is going to be affected. Take two strips 1 inch wide and 6 inches long and glue together after cleaning the material with acetone. Apply the contact cement to both surfaces following the instructions except for the last inch of the strip. Use pressure to apply the two pieces together to ensure a complete bond matching the two unglued areas together. It is preferable to use a roller to ensure the join is pressed together adequately. Heat from a hair dryer or heat gun that warms the material to 120°F to 140°F this will improve the bond and aid in cold weather. When bonding the urethane coated fabric ensure that the surfaces have been thoroughly buffed with a cloth or paper towel dampened with acetone. Be careful with heat sources near acetone saturated rags as it is very flammable. After the sample has had a chance to cure for 4 to 7 days test your bond by pulling the two pieces in a peel test. The preferred method is to clamp one side in a vice while pulling on the other side with a spring scale. A bond that exceeds 14 pounds for 1 inch wide strip will prove adequate in service. 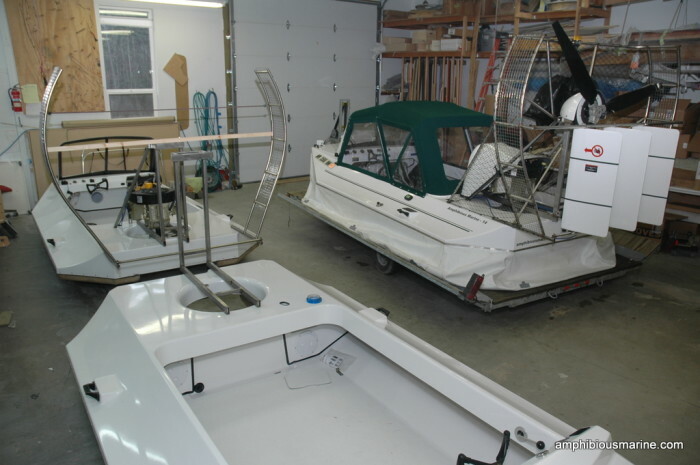 The hull is constructed with gelcoat, fiberglass, vinyl ester resin and a structural foam core. Typically the hull does not require regular maintenance. In any event of damage caused by a collision or rough landing the damaged area can be repaired using either polyester resin, vinyl ester resin or epoxy. The area should be cleaned after sanding to smooth the affected area. Gauges in the bottom for example could be filled with a micro balloons resin slurry prior to over coating with layers of fiberglass and resin. The glass micro balloons form a very light weight putty when mixed with resin at approximately 25% by weight. In freshwater use the electrical system requires little if any maintenance. The craft features marine grade tinned wire throughout with heat shrink, heat seal connectors or waterproof disconnects. Spare fuses should be carried in the toolkit. Maintenance would be restricted primarily to the engine starting battery. The AGM (absorbed glass mat) battery is a maintenance-free type, but does need to be kept charged. When the craft is not in regular use the battery should be charged at least every 6 to 8 weeks. If a trickle charger is used it should be of the approved type for this battery. In saltwater use the electrical connections at the battery and engine need to be inspected every year for signs of corrosion. Of particular interest are the main connections to the starter motor. The drive system consists of the engine, direct drive lift fan, a set of idlers, a belt and the propeller. The system utilizes a synchronous carbon fiber belt to prevent drive slippage and reduce maintenance. The belt tension is set at the factory and need not be altered unless bearings or the belt are changed. A sonic belt tension meter is used to ensure precision belt tension. Many smart phones can be used to set the tension at the 70-75 hz that is required. The drive system features double sealed bearings to ensure long life in the marine environment. The belt has a very long service life but should be replaced as a matter of course every 4 years, or 600 hours. Wear can increase greatly if sand is run through the pulleys. The idlers and propeller shaft use replaceable bearings. The propeller bearings are greaseable whereas the idler bearings are permanently sealed. The propeller guard is fabricated with stainless steel, the engine frame powder coated steel or stainless depending on whether the saltwater series option was chosen. In the saltwater series the engine exhaust system is upgraded with the stainless heat shield and ceramic coated exhaust. The engine is also coated with a corrosion inhibitor and all internal engine wiring protected. In saltwater use it is recommended to wash down the drive system daily to extend the service life. In addition to fresh water wash down, we supply a recommended surfactant that can be applied with a pump spray or hose nozzle adapter. This greatly improves the effectiveness of the wash down. Check for signs of loose fasteners. Telltale signs are typically gray dust emanating from the loose hardware. Particular attention should be paid to the drive system, engine mounts and engine frame to deck. Refer to the Carbon 90 drive setup and tension document for hovercraft belt drive. Check for foreign objects, such as tools near the rotating equipment. Visual inspection of the skirt to check for damage. Rinse the hovercraft thoroughly after use in salt water. Charge the battery every 6 to 8 weeks when not in regular use. Check flotation compartments for signs of water intrusion. Check the ground contact areas of the skirt for damage and conduct repairs if needed. Inspect electrical connection for signs of corrosion if used in salt water. In particular, pay close attention to the main connections to the starter motor, and motor ground.